Police procedurals are an easy sell to the networks, especially if they have a gimmicky twist. There was Ioan Gruffuld as an immortal medical examiner in Forever and the devil himself assisting the LAPD in Lucifer. At one point, producers were developing a drama with King Arthur reimagined as a crime-solving graffiti artist. It’s surprising we haven’t seen a grown-up Encyclopedia Brown tackling serial killers. Fox’s long-running Bones had a unique hook as the protagonists attempt to solve a murder while working with badly decomposed remains. The central character is Dr. Temperance “Bones” Brennan (Emily Deschanel), a brilliant forensic anthropologist who relates better to corpses than other human beings. She is teamed with FBI Agent Seely Booth (David Boreanaz), a former sniper in the Army Rangers. Their working relationship blossomed into a romantic one with the two getting married and having two kids. Unlike Moonlighting, the romance didn’t dampen the unique dichotomy of Bones and Booth with the former being blunt and logical to a fault. Each episode of Bones follows a formulaic structure. Unsuspecting saps discover a grisly corpse, Dr. Brennan and her team of experts are called to the scene, Booth and his partner Agent James Aubrey (John Boyd) investigate and interrogate, Bones pours over every minute detail in the remains, and a final epiphany leads to the killer’s arrest. 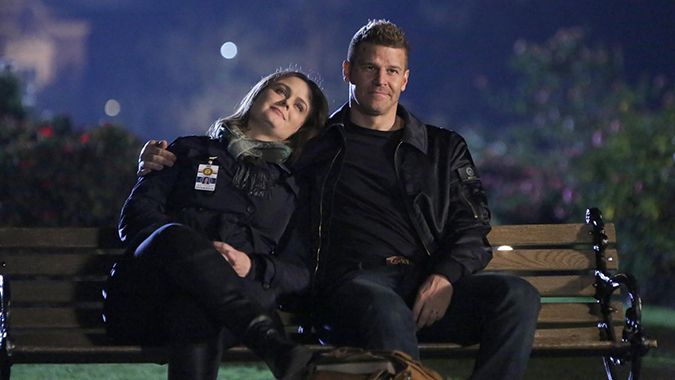 After premiering in the fall of 2005, Bones closes up shop with its twelfth season. In addition to the usual killer of the week, an unknown villain is murdering comrades of Booth from his time serving in Bosnia. “The Hope in the Horror” – Bones is abducted by wayward intern Zack Addy, who insists he is innocent of the murder that sent him to a mental institute. “The Brain in the Bot” – Bones and Booth investigate the death of a philanthropist who was designing advanced AI to assist autistic children. “The New Tricks in the Old Dogs” – Things are not what they seem when Booth and Brennan are sent to a retirement home when an elderly resident is killed. “The Price for the Past” – Booth is horrified when the latest body they discover belongs to his long-time friend and confidant. “The Tutor in the Tussle” – There are no shortage of suspects when a well-regarded tutor to Ivy League hopefuls is found dead. “The Flaw in the Saw” – Booth and Brennan check out a lumberjack competition when one of the contestants is found gruesomely dismembered by a chainsaw. “The Scare in the Score” – Booth’s family is in jeopardy when the killer from his past returns. “The Grief and the Girl” – As Brennan deals with a tragic death, Booth and Aubrey are sent to Newfoundland when the body of an American citizen washes ashore. “The Steal in the Wheels” – Booth and Brennan once again don their aliases of Buck and Wanda to go undercover into the world of demolition derbies. “The Radioactive Panthers in the Party” – Bud Bundy himself, David Faustino, is a suspect in the murder of an ultra-low budget filmmaker. “The Day in the Life” – This penultimate episode follows the POV of each main character as they make major life decisions. 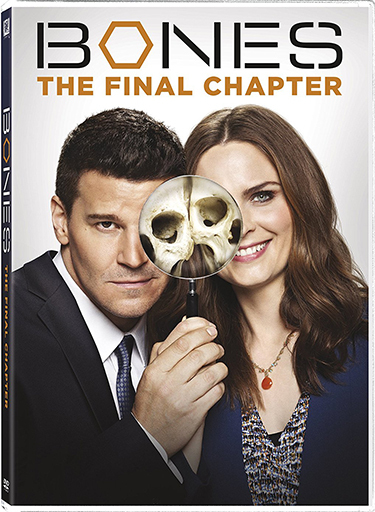 “The End in the End” – After an explosion rocks the Jeffersonian, Brennan is left injured and the interns must step up to uncover the attacker’s whereabouts. The video is presented in anamorphic widescreen with an aspect ratio of 1.78:1. Picture quality is superb with clean images and a pleasing color palette. The audio is presented in Dolby Digital 5.1. Sound isn’t booming, but dialogue is crisp and clear. Back in the Lab: A Bones Retrospective (21:46) is a look back at the series featuring interviews with the cast and crew. They break down how the show was developed, what changed in the pilot, the portrayal of strong female characters, and the eclectic array of supporting characters. Also included is a gag reel. There’s something comforting about the familiar structure of Bones. You drop in on some old friends and no matter what problems may arise, the bad guy gets caught before the hour is done. The mysteries are predictable, but the character dynamics are the true allure of the series.